The Bare Elastek 9mm Dry Hood is definitely a step in the right direction for total warmth. 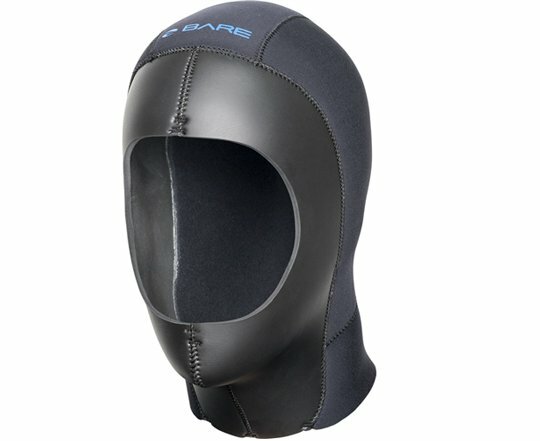 Hood is designed to seal with your skin around the neck using a nylon one skin in seal which when against your skin will keep water exchange to minimum adding warmth to your dive. Superior cold water protection and comfort, so keep yourself warmer when cold water diving. Keeping warm on a cold dive is the ultimate challenge one must overcome to enjoy the dive and think about what they are seeing on the dive not when will it end so I can get warm again. The Bare Elastek Material is a super stretch design for easy of donning and doffing. The main body of the hood is 9 mm nylon 2 with a 5 mm Elastek/Glide-Skin trim-able face and neck seal that slides nicely over your hair. The Hood’s neck seal mates with a dry suit seal collar for a great watertight sealing surface. All seams are glued and sewn for strength and durability. The hood is vented to release trapped or regulator exhaust air for added warmth and comfort. Hood is available in multiple sizes, is black in color and comes with a 24 month limited warranty.